Carry that Giants love forward to The Rumble San Francisco tonight at Milk Bar featuring San Francisco’s Burnt Ones headlining. The garage rock trio (with evident T.Rex influences) are recent transplants to our fair city by way of Indianapolis and are signed to music tastemaker My Old Kentucky Blog’s label Roaring Colonel. The group was just featured on NPR’s All Songs Considered yesterday to boot. Supporting them are Austin-based rockers Ume and San Francisco psych rock/shoegazers, LSD & The Search for God…because lord knows you’re going to need a lot of that to find Him. Entrance is free, per usual, with an RSVP at SonicLiving. And Trumer Pils specials will be flowing. 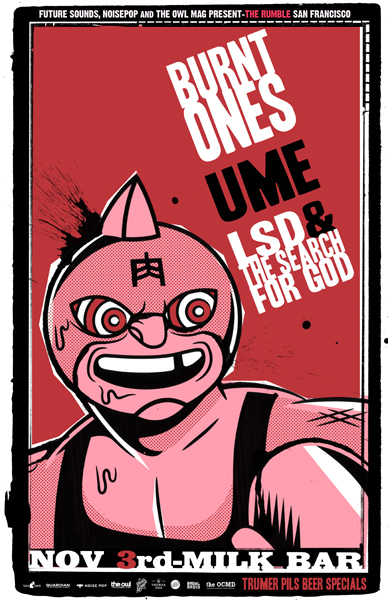 This entry was posted in Shows and tagged burnt ones, lsd & the search for god, san francisco, the rumble, ume. Bookmark the permalink.